In an outcome that has seemingly become routine for the Los Angeles Kings, Jeff Carter scored an overtime goal to lead the team to victory against the Philadelphia Flyers 1-0. The Kings have now won 5 games in a row, and this triumph against the Flyers has catapulted them into the top wildcard seed in the Western Conference. The Flyers and Kings originally came into the league as a part of the same expansion class back in 1967. Each are celebrating 50 years in the NHL, and boast a rich history of success in the league’s most recent half century. Tyler Toffoli played today for the first time since December 20. He had missed the last 19 games for the Kings with a lower body injury. Scratches for the Kings were Jordan Nolan, Andy Andreoff, and Paul Ladue. Michael Del Zotto was scratched for the Flyers with a lower body injury. The other scratches for the Flyers were Shayne Gostisbehere and Travis Konecny, the same trio as their last game against the Montreal Canadiens. Peter Budaj got the start in net for the Kings. Budaj was coming off a dominant shutout performance against the Colorado Avalanche. Michal Neuvirth was in the crease for the Flyers today. He came into this game with 2 straight wins in his last appearances, giving up just one goal on both occasions. The early part of the 1st period was especially bruising. Both teams weren’t allowing much space for their opponent to generate chances. At 11:20 into the 1st, Claude Giroux was sent to the penalty box for tripping Nick Shore. The Kings got 2 shots on goal during the ensuing power play, but the Flyers killed it off. Philadelphia had an opportunity at an open net late in the period, but Brayden McNabb made a great defensive maneuver to poke the puck away and keep the game tied. The 2nd period commenced with some fireworks. Toffoli hit the crossbar on one end, and Sean Couturier countered with a breakaway and rang the puck off the iron himself. Neuvirth later made a phenomenal play on Dustin Brown with a sprawling glove save. Brown intercepted a pass at point blank range, but Neuvirth absolutely robbed him on what seemed like a sure goal. At 11:53 into the 2nd, Brown hit Radko Gudas from behind and was called for slashing. Gudas had tormented the Kings with some huge hits prior to that. The Flyers only got about halfway through their power play when they were whistled for too many men on the ice at 12:50. The game eventually returned to even strength without any goals. The Kings outshot the Flyers 10-4 in that 2nd period. Both goalies looked fantastic to that point, and it was going to come down to whoever blinked first. McNabb attempted a hip check on Nick Cousins at 4:52 into the 3rd period, but was called for interference. The Flyers got 1 shot on goal against Budaj during the power play, but couldn’t score. Toffoli had another great chance to capitalize on a breakaway, but the Flyers were able to scramble back and stop him from getting a good shot off. Neuvirth made another incredible sprawling glove save on a backhand from Tanner Pearson towards the end of the 3rd. It’s a shame that one of these goalies had to lose today. Regulation ended with the score still tied 0-0. Budaj continued his streak of 7 periods without giving up a goal. The Kings once again limited the amount of shots the Flyers got on net, outshooting them 9-4 in the 3rd period. Carter was responsible for 7 out of the 27 shots Neuvirth faced in regulation. Two of the very best overtime teams would compete for that extra point to aid in both their playoff pursuits. Neuvirth made yet another sprawling play with his glove in the overtime period, stopping what would have been a dangerous centering pass. The Kings were finally able to beat Neuvirth, appropriately on a stick side goal from Carter. During his incredible season, Carter has now scored 4 overtime winners, and has tied a franchise record with 9 game winning goals. One of those players who Carter tied, Anze Kopitar, provided the assist on the game winner at 2:35 into overtime on a fantastic pass. Drew Doughty got the other assist. It was the 2nd straight shutout for Budaj, and his 7th of the season. He now leads the NHL in that category. The Kings had 28 shots on goal, while the Flyers had 17 shots on goal. Both teams went 0 of 2 on their power play chances. 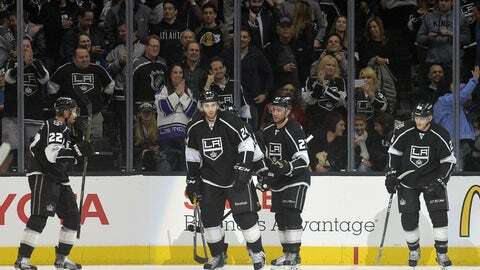 Los Angeles will next play on February 5 at the Washington Capitals. Philadelphia will continue their homestand against the St. Louis Blues on February 6.